Review: In Defence of Bolshevism. Max Shachtman. Boris Souvarine, Stalin. A Critical Survey of Bolshevism, 1939. The labour movement is striving “to renew and reconstruct itself in politics”, writes Sean Matgamma in his Introduction (The Labour Movement and Bolshevism) to In Defence of Bolshevism by Max Shachtman. (Purchase here.) How can this take place? The AWL’s best-known activist¬writer observes that many who identify with Jeremy Corbyn’s leadership have “no conception of socialism at all as the negation of capitalism.” Most Corbynistas are enthusiastic and open¬minded people. It would be a mistake to patronise them. But some, the observer of past left wing surges states, may be first of all looking for a career in politics, think tanks and NGOs. Predictably there is plenty of flotsam and jetsam floated in the “social media age”. A half-thought out “anti¬imperialism” linked to “absolute anti¬Zionism” has become a minefield of “left anti¬semitism”. There are “posh Stalinists”, close to the party chief, who reheat a Boy’s Own view of the gallant Soviet Union fighting Fascism. Socialism in One Country reappears behind efforts to portray Brexit as a working class revolt against elites. And, let’s not forget, in cyberspace, there are over-educated Corbyn supporters. Some see capitalism’s replacement, through Nick Land’s “accelerationism”, pushing forward immanent tendencies, as re-worked by Aaron Bastani, into “fully-automated luxury communism”. The opening essay, “The British labour movement and Bolshevism” is a settling of accounts with those who have returned to politics after Corbyn’s win and who have been supporters of the British “toy¬town Bolsheviks”. The “Little Great Men” of the far-left have considered their groups the revolutionary Party. One stands out. The Workers Revolutionary Party (WRP) was sold to the “Libyan government and secret service”. Their state sponsored hatred of “Zionism” lingers on, in some cases through those who had been directly associated with the WRP such as one¬time London Mayor, Ken Livingstone, Matgamna’s sketch of the history of let-wing opposition to the European Union is also highly relevant. This became a defining feature of the 1970s Broad Left (alliances of Labour left and the Communist Party of Great Britain, CPGB). An early version of a People’s Brexit, the Alternative Economic Strategy (AES) advocated “an amalgam of World¬War¬Two¬style state controlled ‘siege economy’ and Stalinist models of planning, but linked to bourgeois¬democratic liberalism”. (p.43) At present the Morning Star and its supporters, including advisers to Jeremy Corbyn, are fixated on the last point, asserting national sovereignty against “Brussels”. This is not the centrepiece of In Defence of Bolshevism. To open a dialogue with Corbyn supporters and talk about socialism Matgamma offers the practice of the Bolsheviks in the years immediately after the 1917 Revolution. They created a “democratic class dictatorship exercised by the elected workers’ councils…” In this they are due honour amongst the “glories of the working class’s past”. 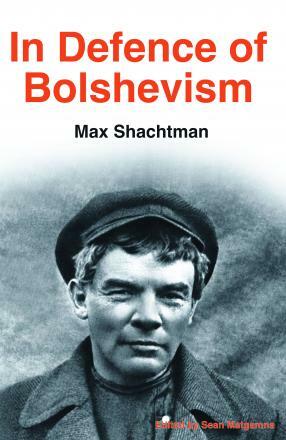 The writer that is chosen to shed light on the Bolshevik achievement is Max Shachtman. For Sean Matgamna, the American one¬time leading figure in Trotsky’s Fourth International was the founder of “heterodox” Trotskyism. Shachtman broke from Trotsky over the defence of the USSR when Stalin ordered the invasion of Finland in 1939. Shachtman’s current supported the judgement that the USSR under Stalin had become a new form of class society that could not be uncritically supported. The AWL has convincingly argued that this turned out not to be anything “new” but a blood¬stained historical by¬way in capitalist development, not any “transition” to socialism. Under the Banner of Marxism, the main polemic reprinted here, was, as Alan Johnson indicates (Solidarity 5.12.18), directed against an attempt by Ernest Erber to trace the origins of Stalinist totalitarianism in Lenin’s political theory and practice. Most people, including this reviewer, will have never heard of Erber, or his split from the Shachtman group, which was a small minority within a small minority of Trotskyists on the already marginal American left. What is the importance of the writings from this dispute? This document, and the articles also included in the book from New International and Labor Action, offer an independent defence of Bolshevik practice in 1917 and the immediate aftermath. They are clearly of their time and place. This is not entirely a bad thing. Shachtman was concerned not just to teach “muddlehead “ Erber a thing or two, with echoes of the purple prose of Engels’ Anti¬Dühring and Lenin’s “polemical” style. The heterodox Trotskyist that he was at this point aimed to stand against “apostates” who moved from revolutionary socialism to an acceptance of the “American Way of Life” and who “identify Stalinism with Bolshevism”. His pages are concerned with the “bourgeois struggle against socialism.” In other words, he stood up for Marxism and communism at the onset of the Cold War. Shachtman is a relentless user of the argument “by circumstances”. This blames any repressive anti-democratic action of the Bolsheviks when Lenin was at the levers of power on conditions beyond his, the Bolsheviks’, and the democratic soviets’ control. Lenin gambled. They were “summoned to hold the first revolutionary citadel against frenzied and maddened besiegers until the relief columns of the Western proletariat could be brought forward” (p.175). One may accept that the alternatives to the Bolsheviks in that fight were worse without having a present need to join the defence on the battlements. Russia, telescoping democratic and working class stages of the uprising together, did not just fail to trigger any successful socialist revolution in Europe. It did not just set the path for the rejection of democratic representative forms, as Johnson rightly point out. It did not only, from early expulsions and splits and moral annihilation, turn to the policy of physically eliminating opponents. The Bolshevik leadership eliminated workers’ democracy in the Soviets themselves. Inside the workers’ movement the Bolsheviks assumed the right to lead the proletariat above the wishes of wage earners. In June 1918 the All¬Russia Soviet CEC decided that the Left and Right Socialist¬Revolutionaries, and the groups of the Mensheviks, should be deprived of their mandates in the Soviets. They resolved that, “all soviets of workers’, soldiers’ peasants’ and Cossack deputies remove representatives of these fractions from their midst”. In these conditions it is a bold claim that Soviets run in the early 1920s — under Lenin’s rule — exclusively by one party plus “non¬party Bolsheviks” were a model for workers’ democracy and socialist practice. Indeed. Some socialists, including Corbynistas, explain the crack down on opposition by the disastrous Maduro regime in Venezuela and the repression in Nicaragua on the grounds that these “citadels” have to be defended against imperialism. They might learn from the Bolsheviks that eliminating democratic institutions is nothing but a deviation from the road to socialism. The Origins of Reformism: Les Hommes Révoltés. Les origins intellectuelles du réformisme en France (1871 – 1917). Emmanuel Jousse. Les Hommes Révoltés. Les origins intellectuelles du réformisme en France (1871 – 1917). Emmanuel Jousse. Fayard. 2017. Reforms, reformism, and socialism, are words so familiar on the left that few pause to unpick their meaning. In the wake of the Russian Revolution the critique of ‘reformism’ in the name of that conquest of power was adopted by Western Communist Parties and more widely adopted by other sections of the radical left. 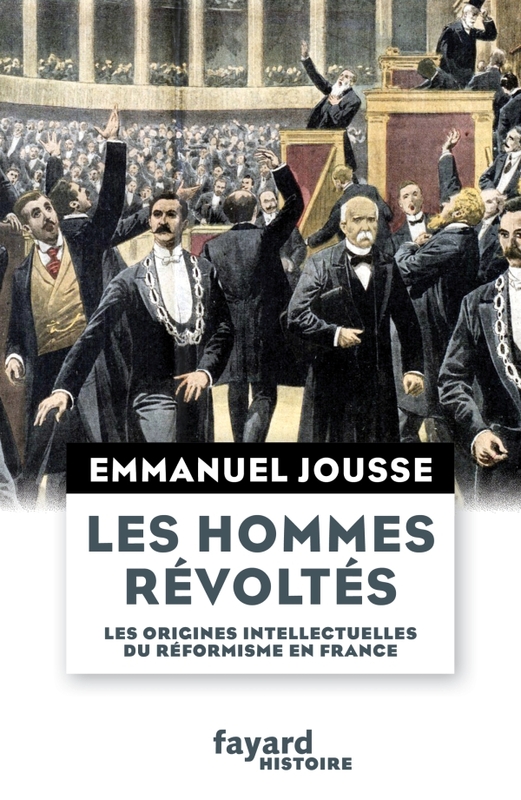 In France, Jousse begins Les Hommes révoltés, the “passion révolutionnaire” of the left could be considered an overwhelming force, in opposition to “raison réformatrice”. Reasoned reforms, government acts to improve social conditions onwards, were considered second best, or worse, in comparison to the total transformation of society. Revolutionary ardour, at its peak in the identification of the Bolsheviks and Jacobins formed the “architecture” of the 20th century French left. It may have faded; its ‘moral primacy’ tainted by Stalinism. Yet, as Marc Lazar, who introduces the present work, has remarked, the imprint of the “culture communiste” remains. (1) Some of this residual scepticism towards promised reforms is not, one might consider, always a bad thing. One of the consequences of the defeat of the Presidency of François Hollande, and his avowedly reformist Socialist team, by Emmanuel Macron and his movement En marche! is to throw – the previous and the incoming President’s record justifies, the term ‘reform’ again into discredit. Les Hommes révoltés is about the roots of socialist reformism. That is, it gives the term meaning by showing the development of reformisms on the French left before the Leninist scission took place.. It is an historical reconstruction of the early years of French socialism when the movement took shape in a recognisably modern form, when themes of sexual equality, workers’ rights social protection and welfare were first advanced. It is also about the politics very un-modern Third Republic in which women had no vote, workers’ could not freely organise, and there was nothing resembling social security. A ‘notable’ dominated Republicanism dominated the political culture and a Right that could trace their symbols and culture back to the 18th century. In this lucidly set out framework Jousse introduces portraits of figures, some unfamiliar to many on the left today, such as the ‘possibilist’, Paul Brousse, Benoît Malon, editor of La Revue Socialiste, and one of Marx’s first translators but also the advocate of a non-Marxist “socialisme intégrale”. In later parts of the book there is a sustained account of the first, controversial French Socialist Minister Alexandre Millerand. There are many appearances from Jean Jaurès. Towards the end the Minister of Armaments in the War-time Union Sacrée, Albert Thomas, whose connections with the educated elite and proto- ‘think-tanks’ marks him out, in Jousse’s eyes, as not too distant to contemporary reformist politicians. But Jousse is adept in separating the wheat from the chaff. Some description of the 5 tendencies that emerged in the initial stages of French socialism is on any judgement inevitable. While the centre of gravity is Brousse’s reformist and non-Marxist Fédération des travailleurs socialistes de France (FTSF), other actors appear, Guesdists (after Jules Guesde, the leader of the ‘orthodox’ Marxists)) the Allemanists (after Jean Allemane, federalist working class revolutionaries), the supporters of Éduouard Vaillant (who owed something to the last representative of the pure ‘insurrectionist’ tradition, Auguste Blanqui) and the ‘independents’ whose best known figure was Jean Jaurès. Their history is followed up to and after the creation of the unified socialist party the SFIO, in 1905. While, as the author underlines, the prospect of a French Labour Party emerging from the organised workers’ movement never got off the ground, the various socialist parties has close links with trade unions. These included affiliations with the multiplicity of trade and craft associations, as well as less warm relations with ‘mutualists’ and the cooperative movement who were often, in the tradition of Proudhon, hostile to political parties as such. Despite their splits the French left had by the following decades succeeded in winning council seats wider social influence, and it had entered the National Assembly. Another is the account of the Alexandre Millerand controversy, the entry of a self-proclaimed reformist socialist into a government of Republican Defence during the fall-out from the Dreyfus Affair. That the same Cabinet contained, Gaston de Galliffet, the butcher of elderly Communards in 1871, was far from a “légende noire”. It was a living memory for many French socialists, including survivors of the Commune such as Vaillant. A large part of the socialist movement recoiled from this appointment. Jousse traces a whole series of differences that underlay the row. These involved opposing stands on how to defend republican legality – Dreyfus – against the anti-Semitic right, to the necessity of compulsory ‘mandating’ of socialist MPs At the same time this point of principle tended, Jousse emphasises, to be confounded with wider questions within the international socialist movement. Was Millerand a French Bernstein, a “revisionist”? The fact that pure Marxist economics, rather than a general vision of class struggle, played a marginal, if any, part in French socialist politics, still less the Bernstein controversy over capitalist “break-down” and the capacity of capitalism to adapt and continue developing the productive forces, and should have ruled the comparison doubtful. By contrast there is little doubt that the reformists, Millerand at the fore, did have something in common with the German revisionists. They preferred improvements in the here and now to promises about the future. Jousse manages to establish Millerand’s work in his post as Minister of Commerce and Industry, labour reforms within the limited competence of a “non-Régalian”, that is, without independent powers and budgets post. He set up a network of committed advisers and operated closely with trade unions and co-operative associations. As such his work was not seen by all the socialist grass roots as “treason” (Page 250) On the evidence presented, the wide social basis of this support, cannot be dismissed, as Leninists used to do, as the “aristocracy of labour”. This, is we are to believe Les Hommes Révoltés was perhaps a first effort at establishing a socialism capable of putting ideas into practice. It used the tools of solid research and the ability to listen to voices on the ground. Lacking the practitioners’ own words – he notes that Millerand’s text Le Socialisme réformiste francais (1903) barely measures up to the British Fabian’s own self-consciousness of this role, he constructs on himself. That is, that an “open socialism”, found in this reformist past, needs something of Jürgen Habermas’ programme of agreement and rational discussion. That debate can be the ground for advancing the common good in a socialist direction through government – local and national – action. A more sceptical reader might point to the way that key figures in French reformist socialism, from Millerand to the Minister for Armaments, Albert Thomas, were not known for impassioned rationality during the patriotic hysteria of the Great War. One might add that there is a short distance from technical help to technocrat, and that a public domain free of the operation of constraints on rationality of private profit and irreconcilable passions still has to be created. Les Hommes Révoltés is a landmark in studies of socialist history. It is elegantly written with the clarity that shows the French language at its best. In his opening words and conclusion Jousse also attempts to establish the moral credentials of socialist reformism, in the tradition of Albert Camus’ l’homme révolté (1951) from which his present study draws its name. That is, the stand (“la pensée du midi”, the anti-authoritarian thought of the South)) that revolt against existing conditions, for a better world, has to be wedded to respect for others, the central value of individual autonomy and choice, and above all a refusal to sacrifice lives in the name of History or in a civil war. Whatever else, these are inspiring, thoughtful, goals. (1) Conclusion. Le communisme une passion française. Marc Lazar. Perrin. 2005. For the clearest identification between the most radical moment of the French Revolution and Bolshevism see: Bolchévisme et Jacobinisme. Albert Mathiez. 1920. (2) On the formulation of the famous programme of that party, generally ascribed to the dominant influence of Marx and Engels, he suggests that the pair may have served only as one inspiration amongst others (Pages 97 – 99) It could be that some further details on the troubled past between Brousse and Marx – including the reformist’s anti-authoritarian anarchist original dislike of Marxism – would help clarify the stakes at hand. . The importance of this research can be seen in that the Penguin Edition of Marx’s Writings, The First International and After. Political Writings Volume 3. 1974, asserts Marx’s authorship Page 376. The programme which contains key references to democratic liberties in its ‘minimum’ section, has long represented a thread is often cited by Marxists who defend human rights. (3) Page 403. The Choice of Books. Frederic Harrison 1886. Stalin. Waiting for Hitler. 1928 – 1941. Stephen Kotkin. A Democratic Socialist Review. Stalin. Waiting for Hitler. 1928 – 1941. Stephen Kotkin. Allen Lane. 2017. There are few grimmer tasks for the left than facing up to the reality of Stalin’s Russia. What enthusiasm can be mustered for the October Revolution has to face the totalitarianism that followed. This is not a new dilemma. That Stalin was, in his own and Kotkin’s opinion, a “communist and revolutionary” and that he developed within “the moral universe of Marxism-Leninism” was galling – and contestable – to radical left critics of the first hour, like Boris Souvarine. It is hard to get a measure of the suffering of so many victims. Vsevolod Meyerhold, one of the country’s top theatre directors was one of the countless to fall into the hands of the butchers. In 1939 he was tortured and made to confess to spying for Britain and Japan. After systematic beatings, “Meyerhold’s interrogators had urinated into his mouth and smashed his right (writing) hand to bits” (Page 649) A footnote adds that while this was happening NKVD chief Beria awarded the larger part of his flat to one of his mistresses (Page 1029). He was executed by firing Squad in February 1940. Kotkin is not engaged in the history of the Gulag, only the contours of the Archipelago are sketched, and there are no Kolyma Tales Nor are there accounts of how Communist self-criticism ended in denunciations, or the whispers by a population-turned-delators to the NKVD. We are brought instead to the party machine and to Stalin’s Little Corner in the Moscow Kremlin, where he scanned lists of those caught in the lights of the hunt. “At least 383 execution lists signed by him have survived, containing the names of more than 43,000 ‘enemies of the people’, mostly the highest-level officials and officers (P 490). What kind of man performed filled his days with this never-ending work? Faced with a flood of letters of those appealing for those caught up in the murders, he “showed no sign that he was in the least tormented by the slaughter” (Ibid). Over half of Stalin. Waiting for Hitler is occupied, as its title indicates, with Soviet foreign policy and, above all, with the build up to the war with Hitler’s Germany. From the Spanish Civil, an occasion to further Stalin’s obsession with Trotsky through attacks on the ‘Trotskyist’ (anti-Stalinist Marxist) POUM, Trotsky’s 1940 assassination, the ill-judged war with Finland (met with mass resistance by the Finns), the division of Poland with little perceivable long-term gain, to his wavering dealings with Mao in China, there were few signs of strategic genius. Kotkin’s achievement as a historian of Stalin should not be overshadowed by the often hard to digest text. Key developments risk being submerged by lengthy day-to-day accounts. The plodding style, and turns of phrase such as the “wee hours” are not a help to the reader. But nobody can fail to recognise that the work is a landmark. With such a protagonist in his sights Waiting for Hitler raises deep issues about the nature of the USSR under Stalin. One commanding thread lies in an effort to come to terms with the basis of the tyranny of the ‘vozhd’, the Leader, as Stalin came to be called. The author’s observation that he operated within a “near permanent state of emergency” could be said to cast light on the nature of Stalin’s rule. Lenin has used exceptional measures – a monopoly of political power, imprisonment of opponents, execution of ‘counter-revolutionaries’, censorship – in ‘defence’ of the revolution. These were indefinitely prolonged. That alone gave the Lenin appointed General Secretary scope for his efforts to impose his brand of ‘Marxism Leninism’ on his most “precious resource”, the people of the USSR. “Marx had never advocated mass murder but freedom” (Page 302). This may be scant consolation for those crushed by Stalin, his successors and emulators. But it important for those of us who are democratic socialists to make sure that the real history of Stalin’s rule is as familiar inside our own camp as that of those whom we venerate. We look forward to reading Kotkin’s Death of Stalin. (1) Page 736. Stalin. Paradoxes of Power. 1878 – 1928. Stephen Kotkin. Allen Lane. 2014. Two Years of Wandering. A Menshevik Leader in Lenin’s Russia. Fedor Il’ich Dan. Review. Two Years of Wandering. A Menshevik Leader in Lenin’s Russia. Fedor Il’ich Dan. Translated, Edited and Introduced by Francis King. Lawrence and Wishart. Known to many on the left as the author of The origins of Bolshevism (in English, 1964), this is the first translation into any language of Dan’s Two Years of Wandering. Francis King is the Editor of Socialist History. His introduction outlines Dan’s background and his role in the crises of 1917. Dan, in conditions of political freedom, was part of the leadership of the Petrograd Soviet. Still calling for a “general peace” he took the Menshevik line of ‘revolutionary defencism”, which committed the country to continue fighting until this could be reached and support for a coalition Provisional Government. This policy, opposed by its left wing around Martov, played a key role in the ‘end’ of Dan’s career in Petrograd. Bolshevik victory in October was not the only indication of their political dead-end. In the All-Russia Constituent Assembly elections of 1917 they won just 3% of the vote. Dan’s serious travails began in 1919, when he spent 3 months in the Butyrka prison. Mobilised, again, in his medical capacity, he was put in charge of the Surgical Subsection of the Department of Medical Supplies. This was impossible task, faced with general chaos, the “constant inference of organs of the Cheka”, the sabotage of those who hoped for a return to private ownership and the prevalence of bribery. After protests, in an atmosphere of increasing hostility to the Mensheviks, Dan was reposted in what he describes as “official exile” to Ekaterinburg (Yekaterinburg), where he continued his “work service”. Further “wanderings”, which took him back to Moscow, then to Minsk and the Front in assault on Warsaw and finally to Petrograd, his native city, where Dan was finally caught in the Bolshevik repression and sent to Peter-Paul Fortress. Two Years of Wandering is shot through with insights into those years of upheaval, the gaoling and exile of “thousands of socialists and non-party workers who (had) been so bold as to doubt the divine infallibility of the Bolshevik authorities, with all their fantasies, scandals, petty tyranny and occasional 180-degree turns. “(Page 53) From the famous 1920 visit of the British delegation to a meeting addressed by Printers’ leaders and Mensheviks, which criticised the “terrorist dictatorship of the minority”, the last Congress of Soviets at which the opposition was reluctantly tolerated, to the crackdown after the Kronstadt (1921) which marked the beginning of systematic elimination of dissent, the Mensheviks were disorganised. (3) A party that “had adapted all its tactics to the struggle for an open existence despite the Bolshevik terror.” was unable to mount any effective challenge (Page 98). Dan met an American ‘K’, identified by King as Adolf S Carm, arrested at the Third Congress of the Communist International “According to him he had been arrested on the strength of a denunciation by another American delegate, Haywood, in revenge for a polemical pamphlet K, had published against him in America. K was obviously very frightened and repeatedly stressed his devotion to everything the Bolshevik government did, including the practices of the Cheka.”(Page 155) Carm was released a couple of months later…. For Two Years of Wandering hunger strikes, and a campaign “waged in the workers’ parties and working-class press of Europe” rather than kindness towards people who “had been in the same organisation at the Bolsheviks” The first response of the Bolshevik leadership came to them in the shape of the news that the All-Russia Cheka Presidium had sentenced all Mensheviks to be exiled for one year, and members of the party Central Committee for two years. As negotiations proceeded, their strike ended with the alternatives of, for imprisoned Mensheviks, either administrative exile in remote areas, or departure from Russia (Pages 179- 80) He chose Germany and arrived in Berlin in the winter of 1922. As Francis King writes in his introduction – a significant contribution to the history of Menshevism in its own right – “it is the immediacy of this book which makes it so valuable” (Page 36). Dan shows understanding towards a variety of people, including anarchists, and a grasp of the plight of even imprisoned ‘whites’, that demonstrates the highest “common decency”. But Two years of Wandering is more than a personal memoir; it illustrates the “creation of a “large body of political of political police, operating with few constraints” built to enforce the governing monopoly of one party, the Bolsheviks” (Page 37). Nevertheless, the Menshevik project of creating a ‘bourgeois’ democratic regime without a bourgeoisie that backed it was far from a viable alternative to the Bolsheviks, lacking, as King observes, both the “will” to govern and the instruments to do so. Dan’s evolution towards a form of “reform communism” also missed the tide of history. Yet, apart from its striking honesty, the book, smoothly translated, is a powerful antidote, written from the losing side of history, to the view that the early years of Bolshevik rule were only a joyous carnival of the oppressed. (1) Trotsky’s reply to the Menshevik was, “If it were true that compulsory labour is unproductive always and under every condition, as the Menshevik resolutions says, all our constructive work would be doomed to failure. For we can have no way to socialism except by the authoritative regulation of the economic forces and resources of the country, and the centralised distribution of labour-power in harmony with the general state plan. The labour state considers itself empowered to send every worker to the place where his work is necessary.” Page 153. Terrorism and Communism. Leon Trotsky. New Park Publications. 1971. Pages 249 – 251. Leninism Under Lenin. Marcel Liebman. Merlin. 1980. (2) Page 15. Social Democracy and the Wars of Intervention. Russia 1918 – 1921. Leon Trotsky. New Park Publications. 1975. (3) King reproduces the speech of the Socialist-Revolutionary leader Viktor Chernov to this meeting with the British Labour delegation in Appendix 1. Liebman called his invitation ”an act of provocation” Liebman. Op cit. Page 251. See Socialist History Society Newsletter. 1. The peasants should retain, on a collective or individual basis as they may freely decide, the public and privately owned lands which they seized and parcelled out at the time of the Revolution. Other lands, not as yet distributed, should be leased on a long-term basis to needy peasants and peasant associations, except for those lands on which large-scale model husbandry is being, and can continue to be, carried out by the state or by leaseholders. The decrees abolishing the Committees of the Poor should be put into effect without exception. Agricultural communes should not be established by force, either directly or indirectly. Government-held supplies, agricultural implements and seed should be equitably distributed not only among communes but to all peasants who need them on communes and soviet lands. a. The state should purchase grain at agreed prices involving a large application of the barter principle; it should then be sold at low prices to the poorest dwellers in town and country, with the state making up the difference. The state should make purchases through its agents, co-operatives or private traders on a commission basis. b. The state should purchase, at a price equal to the cost of production, a certain proportion of the grain surpluses held by the better-off peasants in the more fertile provinces, the proportion being decided with the advice of freely elected representatives of the local peasantry. c. Grain should be purchased by co-operatives and workers’ organisations, who should at the same time make over the stocks they have procured to government organs concerned with food supply. The state retains the right to requisition supplies from large landowners who are deliberately hoarding them for speculative purposes. Transport arrangements are under the primary control of the state, co-operatives and workers’ organisations. All anti-profiteer detachments should be disbanded. The transfer of foodstuff from a particular locality shall not be prohibited save in exceptional circumstances and by a decision of the central legislature. The state shall assist, materially and by administrative measures, the transfer of workers and their families from places where food is scarcest and their resettlement in fertile areas. 3. The state should retain control of major industrial enterprises that are fundamental to economic life, such as mines, metallurgical plant, the chief branches of the metal-working industry, etc. However, in all places where this seems likely to improve or animate production or to extend its range, recourse may be had to organising such enterprises by a combination of state and private capital, by the compulsory formation of a trust under state control or, in exceptional cases, by means of a concession. All other large industrial enterprises except where state control is desirable for fiscal or other reasons and would not be deleterious to production, should as a rule be gradually transferred into private hands, by leasing to a co-operative or a new entrepreneur, or to the former owner on condition that he accepts the obligation to restore and organise production. The state shall regulate the distribution of fuel and raw materials to different branches of production, enterprises and areas. 4. Small-scale industry should in no case be nationalised. 5. The state shall regulate the distribution to different areas, in accordance with a fixed plan, of the chief articles of mass consumption such as textiles, farm implements, salt, lighting materials etc with the aid of co-operatives and private traders. 6. As regards trade in other articles of the firs necessity and also in luxuries, the state should refrain from imposing restrictions and should allow co-operatives and private enterprises to function freely except in cases where regulation or even monopoly is desirable on account of the extreme scarcity of the product, e.g. medical supplies. 7. The credit system should be so reorganised as to facilitate in every way the use in trade and industry of available funds accumulate by producers in town and country and to afford scope for private initiative in trade, industry and agriculture. 8. The repression of speculation and trading abuses should be left to the courts and governed by specific legal provisions. All arbitrary acts of requisition, confiscation and the detention of goods should be punished. The law should protect rights of ownership in the case of all industrial and commercial concerns that are released from nationalisation. In future, when expropriation is required by the public interest it should take place on the basis of a decision by the supreme legislative bodies and on conditions determined by them. 9. Workers’ unions, in addition to taking a direct part in the work of regulatory bodies, are also and primarily representatives of the interests of the proletariat vis-a-vis the sate and private entrepreneurs. In this latter capacity they should be wholly independent of any state bodies. 10. Wage rates in state enterprises should be raised and minimum rates fixed for private enterprises in accordance with the commercial price-level for necessary goods…. 11. The decree on consumers’ communes should be revoked. Workers’ and general co-operatives should be preserved as autonomous organisations, without the imposition of appointees or other interference in their internal affairs. They should also have the right to carry on non-commercial activity such as publishing, education, etc. The right of voting for members of soviets should be extended to all workers of both sexes. Town and village soviets should be elected by all workers, with a secret ballot and freedom of canvassing by word of mouth and by the press. Soviets and Executive Committees should be subject to re-election at fixed intervals. Soviets shall not be entitled to exclude individual members or groups from their midst on political grounds. All officials and public bodies shall be subordinate to local soviets and Central Executive Committees.all workers of both sexes. Town and village soviets should be elected by all workers, with a secret ballot and freedom of canvassing by word of mouth and by the press. Soviets and Executive Committees should be subject to re-election at fixed intervals. Soviets shall not be entitled to exclude individual members or groups from their midst on political grounds. All officials and public bodies shall be subordinate to local soviets and Central Executive Committees. 2. The Central Executive Committee of Soviets should once more function as the supreme legislative and administrative body, its proceedings being open to public observation. NO law shall come into force without being discussed and approved by the CEC. 3. Freedom of the press, of assembly and of association should be restored, and any party representing the workers shall have the right and be allowed to use premises for meeting, paper supplies, printing workers. Etc. Any restriction of this right that may be necessitated by the war against counter-revolution shall be established and clearly defined by the legislature; it shall not infringe the basic liberty and shall be applied only by the courts and institutions under their direct control. 4. The Revolutionary Tribunals shall be reorganised in such a way that the judges are elected by all the workers. Together with their subordinate investigatory commissions they shall have sole responsibility for combating counter-revolution. All officials should be directly liable to prosecution before these Tribunals for illegal acts committed in the execution of their duties, at the suit of the injured party in each case. Terror shall be done away with as an instrument of government; the death penalty be abolished , and likewise all investigatory and punitive organs independent of the courts, such as the Extraordinary Commission (CHEKA). 5. Party institutions and cells should be deprived of state authority, and party members of all material privileges. 6. The bureaucratic apparatus should be simplified by the extension of local self-government. 7. A policy of understanding should be pursed vis-a-vis the nationalities which have for any reason broken away from Russia, in order to put a speedy end to the Civil War an restore the unity of the state on a basis of national self-determination. The Cossack districts – Don, Kuban, Tersa, The Urals, Astrakhan, Orenburg, etc – should be allowed the widest possible autonomy and there should be no interference in their internal affairs or system of land tenure. Siberia should have regional self-government, and the independence of Finland and Poland should be recognised. Sotsial-demokratiia i revolutionsiaa. Sbornik dokumentov (Odessa, 1920), pp 9-15. 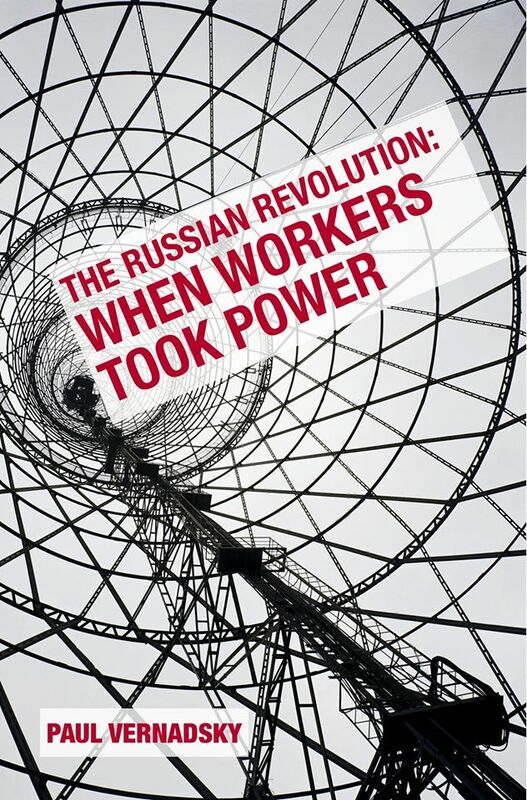 Russian Revolution: when workers took power. Paul Vernadsky. Review: ‘1917 and problems of democracy’. 1917 and problems of democracy. Solidarity. 6th of September. Alliance for Workers’ Liberty. He states, “In October 1917 the Russian working class, led by the Russian Social Democratic Labour Party (RSDLP, Bolshevik party), took power through their mass, democratic soviets (councils).” The lessons of the revolution remain relevant to working class politics today.2 Vernadsky tells the story of 1917, from the slaughter of the First World War, initial protests and strikes, to the February Revolution and October. The Russian Revolution is not just a history of events. Vernadsky offers a valuable introduction to debates about this party, the Bolsheviks, much of which was stimulated by Lars Lih’s Lenin Rediscovered: What is to be done in context. Other writers covered include Lenin enthusiast Paul le Blanc, and Tom Twiss’s measured account of Trotsky’s evolving, contradictory, views of the development of bureaucracy in the wake of revolution. There is a strong section on the Women’s Revolution, paying special attention to the “futuristic vision of Aleksandra Kollontai, as illuminated by studies of “Bolshevik feminists”. 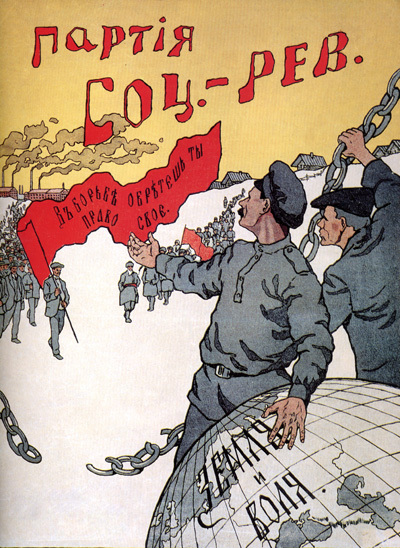 The Bolsheviks, if this account stands, were very far from political outriders, a messianic party-sect, but part of the mainstream of European socialism.6 Lih saw this as the basis for “fighting for democracy to the end” as a precondition for workers’ power, and socialism. For Lih this “old Bolshevik” stand guided Lenin right up to October and the overthrow of the Provisional government, “to carry out a thorough-going democratic transformation”. Vernadsky enters into the — lengthy — debate on this claim. He states that Lenin’s assessment of the growth of the soviets and soldiers’ committees meant that his call for the overthrow of the Provisional government meant that Lenin took “steps towards permanent revolution”. That is, an acceleration of revolutionary “stages” towards, he contentiously asserts, a position where the victories of the Bolsheviks, “deconstructed capitalist relations of production and put in place an economic system where the imperative was social need, not private profit.” It is undeniable that this prospect inspired millions inside and outside Russia, with the hope that socialism was on the agenda. For many of us that wish still burns.7 Yet, many unresolved issues remain to be discussed from this thought-provoking book. Two could be signalled; questions about the body that “led” the Russian working class, and the direction it began to take them in the aftermath of October. If we accept the view that the Bolsheviks were a democratic party with open debate and a real base in the working class and popular masses, what kind of template had Lenin and his tendency adopted? A critical description of the pre-1914 SPD “oligarchy” by Robert Michels developed themes already circulating on the left in Germany itself, and internationally by “revolutionary syndicalists” like the French writer George Sorel. In light of the monstrous oligarchy of Stalinist bureaucracy these limits inside Lenin’s “model” apparatus might inspire further reflection. The next is that even supporters do not argue that in power the Bolsheviks were always democratic. Many would also question as to how far they respected the workers’ democracy they contrasted to “formal” Parliamentary pluralism. The well-documented cases of human rights abuses, which began with October, and were accelerated by the creation of the Cheka, cannot be explained away by “external conditions”, the civil war, and the need for Red Terror to stave off the very real threat of a far-right regime that would have drowned the revolution in blood. The need for independent law, in however difficult circumstances, respect for the people’s rights, was denied during the dictatorship of the proletariat. What kind of political instrument can introduce non-capitalist relations of production with these limits on democratic decision-making? Socialism was, and is, far from a self-evident thing. How can a transitional mode of production to communism be formed without free debate about what kind of economy, what kind of production, what social goals people are working towards? 1. Pages 8 and 809. Le passé d’une illusion. François Furet. Éditions Robert Laffont. 1995. 2. Pages 9 and 19. The Russian Revolution. When the workers took power. Paul Vernadsky. 3. Page 114. Paul Vernadsky Op cit. 6. Page 398. Lenin Rediscovered: What is to be done in context. Brill. 2005. 7. On Lih Pages 163-9. Next quote, Page 19. Paul Vernadsky Op cit. Political Parties. Robert Michels. Transaction Publishers. 2009 (originally published, 1911.) Georges Sorel in 1902 had already written of the SPD’s “spirit of authoritarianism and bureaucracy in a New Church run like an huge civil service (“administration”) page 188. L’illusion du politique. Georges Sorel et le debate intellectuel 1900. Schlmo Sand. La Découverte, 1984. 8. “La démocratie soviétique a été définitivement étouffée au moment de l’interdiction des partis soviétiques, après la guerre civile, et non pas lorsque l’alternative était soit capituler devant les Blancs, soit défendre la révolution par tous les moyens. Elle fut donc étouffée après la victoire, alors qu’aucune armée blanche n’était plus présente sur le territoire de la Russie des soviets. Ernest Mandel. Octobre 1917 : Coup d’Etat ou révolution sociale ? La légitimité de la révolution russe. Cahiers d’Etudes et de Recherches, n°17/18, 1992. 9. The Dictatorship of the Proletariat from Marx to Lenin, Hal Draper. Monthly Review Press. 1987. Extract from Paul Vernadsky’s book: The opening days of the Russian Revolution. Left Socialist Revolutionaries Win Backing in Leftist Poll on 1917. No doubt important international leaders of the proletariat, like Tariq Ali, Alex Callinicos, Lindsey Germain and John Rees, would have found that would have been key advisers of the Bolsheviks, commanders of the Red Army and People’s Commissars. But many people, and not the least, have found that they would have been Left Socialist Revolutionaries. This is odd, I’d have expected to turn out a Internationalist Menshevik. But like many I got, Left SR….. The SR’s, of all stripes, were in favour of continuing the war. Apart from that many of their policies were not at all bad. At the 5th All-Russia Congress of Soviets of July 4, 1918 the Left Socialist-Revolutionaries had 352 delegates compared to 745 Bolsheviks out of 1132 total. The Left SRs raised disagreements on the suppression of rival parties, the death penalty, and mainly, the Treaty of Brest-Litovsk. The Left SR uprising or Left SR revolt was an uprising against the Bolsheviks by the Left Socialist Revolutionary Party in July 1918. 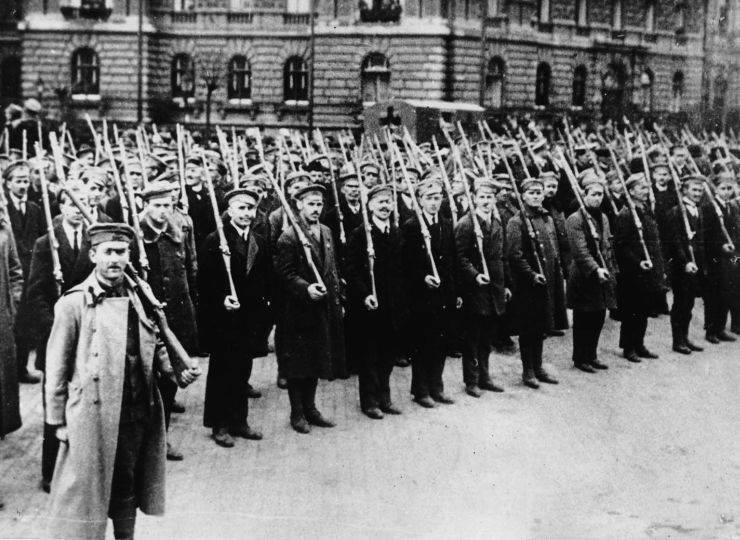 The uprising started on 6 July 1918 and was claimed to be intended to restart the war with Germany. It was one of a number of left-wing uprisings against the Bolsheviks that took place during the Russian Civil War. But are there more details on who the left SRs were? LibCom has this interesting article: Literature and the Left Socialist-Revolutionaries. Revolutionary organizations in Russia in 1917-1921. At the peak of the political influence the number of organization members were approaching 200 thousands. The Left SRs supported the autonomy of the workers’ councils and the federal structure of the country. They criticized Bolshevik Party for the establishment of the dictatorship. A very sad fact is that when people talk about the poets and the writers of Russia who accepted and supported Russian Revolution, they immediately associate them with Bolshevism. But supporting Russian revolution and supporting Bolshevism is two different things. For example, the poet Yesenin was a member of the PLSR and sympathized with Makhno. Yevgeny Zamyatin is an author of the novel “We”, written in 1920. This book is one of the great anti-utopias of the 20th century, along with the works of George Orwell. Zamyatin was subjected to repression in the Soviet Union because of this book. In this novel anti-state rebels are fighting for the “fourth revolution”, which aims to liberate people from the power of the totalitarian state: an allusion to the concept of the “third revolution”, anti-totalitarian anti-Bolshevik Revolution of the Left Socialist Revolutionaries and anarchists. In 1919, Zamyatin, along with many well-known artists (Block, Remizov, Ivanov-Razumnik) was arrested during the Left SRs strikes in the factories of Petersburg. The Left SRs were not peaceful legal strikers: their struggle was not limited to economic demands, they fought for free elections to the councils and wanted the elimination of the violent political monopoly of the Bolsheviks. Strikes were carried out by radical methods: factory’s Left SRs militia used weapons. While all of these cultural figures were not related directly to the performances of the Petersburg workers, they had a direct link with the Left SRs. Since 1916, an informal group of “Scythians” began to form around the famous writer Ivanov-Razumnik, which gravitated toward the left wing of the Socialist Revolutionaries. It included Andrey Beliy, Alexander Blok, Klyuev, Lundberg, Forsh etc. In the years 1919-1924 in Russia the Free Philosophical Association, WOLFILA, was patronized by the Left SRs. It worked even with a wider circle of writers, artists, social thinkers. Some of them cooperated in the newspapers published by the Left Socialist-Revolutionaries, “The Banner of Labour” and the magazine “Our Way”. Of course, we can not say that they were all standing on party positions, although, for example, Ivanov-Razumnik was a member of the Central Committee of PLSR. But all of them in one way or another sympathized with the revolutionary-socialism LSR based on the ideas of self-government and individual freedom. Aleksandr Blok’s poem “Scythians” is a great anthem of the Russian revolution, which is nothing else than a poetic statement of Left SRs program. If the concept of “revolution” is ever to be cleaned from the USSR flavour, then, perhaps, the work of poets, writers, scientists, philosophers of the Scythians and WOLFILA would become closer and more understandable to many people. P.S. Important role in the discovery of the influence of the Left SRs on Russian literature belongs to the modern historian Yaroslav Leontiev. And we shall fight if war you want, take heed. To you this was a distant tale – no more. You’d yell an order and the guns would roar. An end to placid life in utter spoliation. To seek to solve the riddles of a sphinx. Replete with ardent love and ardent hate. But like a fire will destroy and burn. And in Cologne a shadowy arcade. Of our embrace your bones begin to creak. As in the fields so playfully they swerve. Until they willingly and meekly serve. Turn to the peace of our embrace. There is still time. Keep in its sheath your knife. Comrades, we will be brothers to your race. Say no – and we are none the worse. We, too, can utter pledges that are vain. Of our sons’ distant offspring racked with pain. An ugly grin on our Asian face. With the Mongolian savage horde will meet. With our slanting eyes so cold and narrow. Burn our white brothers’ bodies torn asunder. To work and peace invite our warming fires. Come to our hearth, join our festive meal. Called by the strings of our Barbarian lyres. Corbyn and the “Actuality of the Revolution” – Counterfire on Georg Lukács and Labour. Ipswich Workers’ Militia: Ready for the ‘Actuality of the Revolution’. While thousands across the country have been attending rallies for Corbyn, and while the Labour establishment is in unprecedented disarray, some “thoughtful” and prominent former supporters of Corbyn have succumbed to self doubt and pessimism. This article will argue that the arguments they use reflect a way of thinking that has – throughout the last century – meant that many movements with the objective strength to defeat the right have floundered and failed. We will call this way of thinking vertigo and we will show how the great Hungarian Marxist Georg Lukacs identified the cure for vertigo at the heart of Lenin’s thought. In Corbyn: momentum meets vertigo Counterfire’s Dave Moyles has no doubt that the main problem of the left is those infected by “doubt and pessimism”. Standing on the ledge of a great peak, they look at the abyss beneath and not upwards to the heavens. The waverers typically make two key points. First that when they backed Corbyn for leader last year they never expected him to win, but rather to “shift the terms of debate”. Second, now that he has won, they argue, we are teetering on the edge of a precipice. The wave of enthusiasm could easily turn to despair. Just as defeat of Michael Foot laid the groundwork for Tony Blair (in a very telescoped, teleological view of history) so will this success be followed by defeat that could see the whole left destroyed. And the cliff on which we are standing is crumbling in the face of attacks from the media, the PLP and the Tories. Be afraid, be very afraid. Take courage comrades! Look, he asks us, at the Russian Revolution! Or just The Revolution. The Hungarian Marxist Georg Lukacs identified the cure to vertigo as the core uniting principle behind Lenin’s thought: the actuality of the revolution. …seen from the perspective of the actuality of the revolution, the question is how do we maximise the level of political organisation, confidence and radicalism across the mass of ordinary people; how do we turn what has traditionally been the second party of British capitalism into a transformative force; how do we weaken the power of the British state to resist this movement. Then the answer is very clearly Corbyn – and the mass rallies, mass membership, organisation of resistance to the PLP that is going on as part of the Corbyn movement. Then a question like Scotland is easy to answer – don’t be so blinkered as to worry about numbers in Westminster – the Scottish question is about fundamentally weakening the British state. It’s all about the ‘state’. Counterfire is there to help sort things out..
Counterfire today argues for its members to be at the heart of the movements at the same time as focusing on the big picture – and we ask our members to discuss and debate the best strategy for these movements. Our website and our paper connect the struggle and point to a socialist strategy within them. But it is clear an organisation of the sort Lenin envisaged would have to be far bigger and incorporate many activists who today are part of no organisation – as well as some who are currently part of other organisations. We will need this if the energy and desire for change captured by the Corbyn movement is going to be able to keep rising and achieve real transformative change. Lukacs and Lenin teach us to be more ambitious – we should be storming the gates of heaven. Counterfire’s long-standing strategic faults are laid bare in this lyrical article. They have a common source, Lenin as read through Lukács. This approach means that in every “concrete analysis of the concrete situation” one can trace the operation of an inexorable dialectic. Inside of which a revolution is about to burst reality asunder. Rees has something in common with John Holloway’s views in Crack Capitalism (2010), that capitalism produces an endless series of ‘cracks’ in which revolutionary sparks fly. It is, in short, a practical-theoretical embodiment of class consciousness. Behind this is a fundamentally awry take on Marxism. Whatever the merits of Rees’s magnum opus on dialectics, and his analysis of Lukács, from Lenin to History and Class Consciousness, the application of the ‘dialectic’ is not only barely ‘mediated’ by politics, (or more crudely, reality) it is “expressive” at every moment. Moyles expresses this to the point of caricature: from Corbyn Rally to Revolution it is but a step. Can we dismiss the weight of right-wing ideology, nationalism, the views of the general public, the rightward drift across the whole of our Continent, the decades long hegemony of conservative ‘neo-liberal’ ideas affecting social democracy itself , the present Tory Government, the lack of actually existing successful example of economic alternatives to capitalism, not to mention the Fall of Official Communism, the failure of ‘anti-imperialism’, the power of Capital? Are they all about the vanish faced with the cunning of Proletarian Reason? That the revolution is both actual (in the English sense, real) and ‘actuel’, in the sense used in many European languages, present? Does anybody else seriously believe that the present disputes in the Labour Party will end with Jeremy Corbyn heralding the Revolution? That “an organisation of the sort Lenin envisaged” is about to emerge? People involved with the, the People’s Assembly, the anti-austerity alliance dominated by Counterfire leadership, not to mention the Stop the War Coalition in which the same group is heavily involved, should perhaps be informed of how Rees, German and Moyles consider their role in creating this “organisation”. And no doubt the ‘Corbyn movement’ as well. Although given that Rees and mates, echoed in the dwindling People’s Assembly, have claimed that the Tories threatened a “coup” during the last General Election, that the Brexit vote was a great “opportunity” for the ‘left”, it’s unlikely that there are many people around who take this lot seriously. (1) Counterfire’s Jon Rees outlines his highly individual account of Lukacs in The Algebra of Revolution. The Dialectics and the Classical Marxist Tradition. John Rees. Routledge 1998. See the indulgent review by Alex Callinicos The Secret of the Dialectic (1998). (2) John Rees (Extracts) Strategy and Tactics: how the left can organise to transform society. Counterfire’s Site). 2010.